Homeless communities are increasingly under attack even as affordable housing is scarce. But one unique Bay area community is refusing to be disappeared. On a tree-shaped peninsula that juts into the San Francisco Bay, on top of layers of concrete rubble, rebar and a dense carpet of vegetation, stand a collection of small homes. Along the southern coast is a one-room castle, built from the rubble. Along its northern coast are fanciful sculptures: a dragon, Don Quixote and a towering woman emerging from the water with outstretched arms. In between stand an amphitheater, a toy garden and countless paintings. 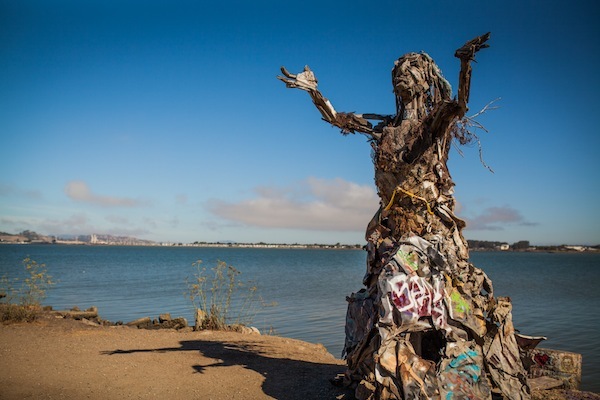 The 64 residents of the peninsula, known as “the Albany Bulb,” have created, cleaned and maintained much of this artwork and their tiny houses. In response, residents of the Albany Bulb and allies from the East Bay Area have united to form the group Share the Bulb, which is orchestrating an escalating campaign to save one of the most unique communities in the United States. Their goal is to prevent Bulb residents from being evicted, or, at the very least, to forestall the eviction until the city agrees to work with Bulb residents to secure affordable alternative housing. It’s not an easy charge: Current residents’ only claim to the land is the sweat equity they’ve put into it over the past two decades. And while housing may be a human right, at least according to the United Nations, it is a right the United States reserves for those with the money to buy it. Before becoming a home and a thriving art scene, the Bulb was a landfill. 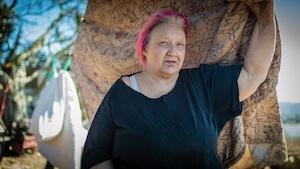 According to activist and artist Osha Neumann, the fill opened in 1963 and quickly collected an array of discarded materials. “[There were] tons of concrete rubble, rebar, wire mesh, corrugated tin, steel, iron, coke, slag, asphalt, glass, plastic and excavated dirt,” he said. After the landfill closed in January 1984, plants and animals began to reclaim the space. “Nature had little to do with its creation, but when the dumping stopped nature saw its chance,” Neumann recalled. In the early 1990s, homeless people began to construct homes in the abandoned landfill. They eventually formed a small neighborhood, mostly tucked into the dense vegetation where their presence would go unnoticed. Over the next two decades the space evolved and transformed into a full-fledged community until the city issued a mass eviction notice. City governments across the country have passed a series of laws over the last few years that criminalize or displace homeless communities, even as the country limps through the worst housing crisis since the Great Depression. Palo Alto, Calif., passed a law making it illegal to sleep in one’s own car. Columbia, S.C., passed an initiative banning people from sleeping or loitering downtown. One Miami commissioner is attempting to turn the acts of eating on a sidewalk or sleeping on a park bench into arrestable crimes. And even allies of homeless communities are not always safe from the increasing enforcement. In Raleigh, N.C., police threatened to arrest members of a local charity for feeding homeless people. Even as residents testified, two organizations continued to push the city council to approve the eviction so that the Bulb can be incorporated into an adjacent state park: a local group called Citizens for East Shore Parks, and the San Francisco Bay Chapter of the Sierra Club. Bulb residents have argued that the eviction violates the Sierra Club’s Environmental Justice Policy, especially because Albany does not have affordable housing for Bulb residents to move into. The city does not even have a homeless shelter. The city’s current plan is to install dormitory-style trailers in a parking lot to house about half the Bulb’s residents. The city has made no indication that long-term affordable housing will be made available after the trailers are removed. Following the city council meeting, non-residents joined the effort, and the new group turned to creative activism. First, people chalked the outlines of 64 sleeping figures on the sidewalk of Albany’s main commercial street so others in town could see what it would look like to have the Bulb community evicted and residents forced into homelessness. Next, residents and supporters returned to the same street, pitched tents, rolled out sleeping bags and staged a camp-out. They talked to passers-by about the pending mass eviction while the police watched from a nearby parking lot. 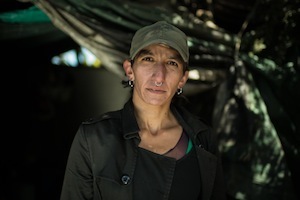 In the morning, after news crews came to interview an organizer, the campers held a meeting and planned future actions, including a protest outside a Sierra Club event. These actions demonstrate the beginnings of a new vision, one in which the residents of the Bulb — literally at the East Bay’s margins — move into the center of political decisions and actively decide the fate of their own homes. Rather than mass eviction, Bulb residents have proposed an alternative vision for the space and outlined their own needs. These ideas include installing a source of water (currently they have to carry water a mile and half to their homes) and more sanitation infrastructure so residents and non-residents alike can enjoy a clean space. Residents have also asked for assistance with health care and, for some, help transitioning to housing in town. If the city were to support the Bulb — rather than threaten its existence or simply ignore it — this shift would extend beyond the small town of Albany and challenge entrenched national ideas about the meaning of home and community. In the logic of U.S. politics, home is the place you have exchanged money to inhabit, and the only values communities share are property values. For Bulb residents, the story is different: Home is about love of a place, and community is about the power of connection. Like the residents themselves, that idea exists on the margins of mainstream political and economic life. But in Albany, Calif., it’s attracting an increasing number of supporters – both residents and nonresidents alike – who have resolved to defend the commons. Root lives at the Conspiracy of Sharing, a gift-economy community in Berkeley and works on issues of land use, food justice, and human rights. This article needs to be printed in The Journal and other publications. Amazingly, there are many people in Albany who know nothing about this situation. When this happened in 1999, I had no idea there were homeless in Albany and no clue about people living at The Bulb. I believe all citizens of this city should know about the situation. I have noticed that The Patch has an unequal division of opinion on this issue. The people supporting the eviction of the Bulb residence outnumbers the people supporting them by a big margin. Is a true reflection of Albany citizens? I have found many people in favor of leaving the Bulb the way it is or supporting the people there in some useful, realistic way. I have not found one person who thinks they should be evicted and treated the way it is going now. I believe those trailers are not for the people of the Bulb to use, it is for the City government to feel better about what they are doing and is actually an injustice for all concerned, including Albany taxpayers who are paying for them. If only the Homeless Commission could have finished their work and come up with a more dignified solution instead of stopping their work months before schedule and voting to evict seemingly under pressure from the two organizations mentioned in this article. I agree with Megan, great article! More people should read it!